Location: North 62:04.287, East 008:06.608 (GPS at the summit). Route description: From the trailhead by the road at Billingen, ski up the field passing a few buildings. Slightly further up, the river Torda runs in a gorge while the river Store Føysa comes down in a distinct valley slightly right when facing uphill. 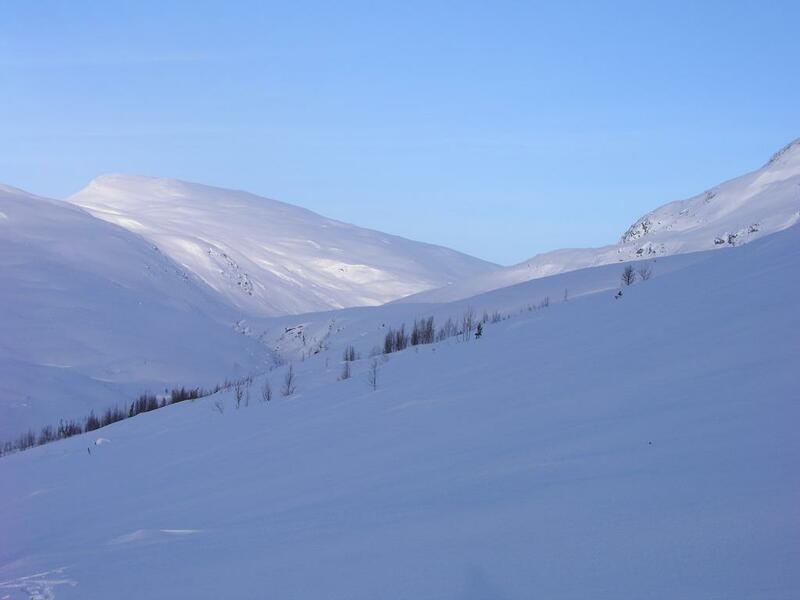 Locate the bridge that crosses Torda and continue up the slope just west of Store Føysa. The slope is more uniform if you stay a bit west of the river. Climb this hill (about 500 vertical meter) and then contour into the valley in order to reach the river fork at 1260 meter. One should climb almost to 1300 meter in order to do this, avoiding the steeper slope down near the river. Descend to the river fork and cross the river. The left fork comes from the lake Langvatnet (1422m), while the right fork comes from the lake Skarvedalsvatnet (1548m), where we are headed. Instead of following the river, head north-east up the gentle slopes and pick a route that contours north of point 1616 at the 1500 meter level. The route now tourns more east into the flat valley between Gråhøe (1945m) on the north and Skarvedalseggje (1961m) to the south. From here, climb slightly steeper, but easy terrain, into the valley between Gråhøe on your left (west side) and Ø. Gråhøe to the right (east side). 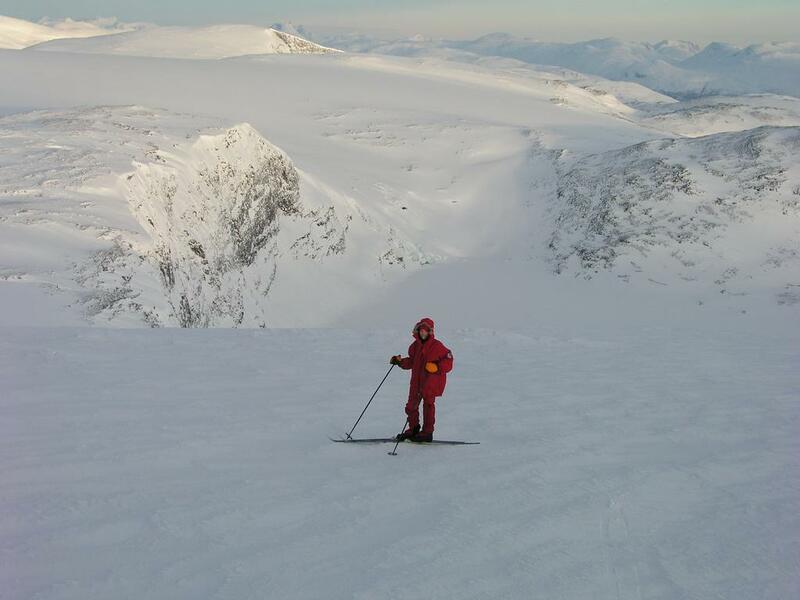 Shortly before reaching the saddle, one can continue the gentle ski ascent directly towards the summit. Comments: I did this trip with my son Pål Jørgen, age 14. We started from Bergen in the early afternoon on a Thursday, and stayed overnight at the hotel in Stryn. The next morning we drove to Billingen and started skiing around 0915. We established base camp at elevation 1590 meter at location N62:03.943, E008:03.719, just north of Skarvedalsvatnet (1548m). Breaking trail in fairly deep snow, while gaining almost 900 vertical meters took us 6:45. 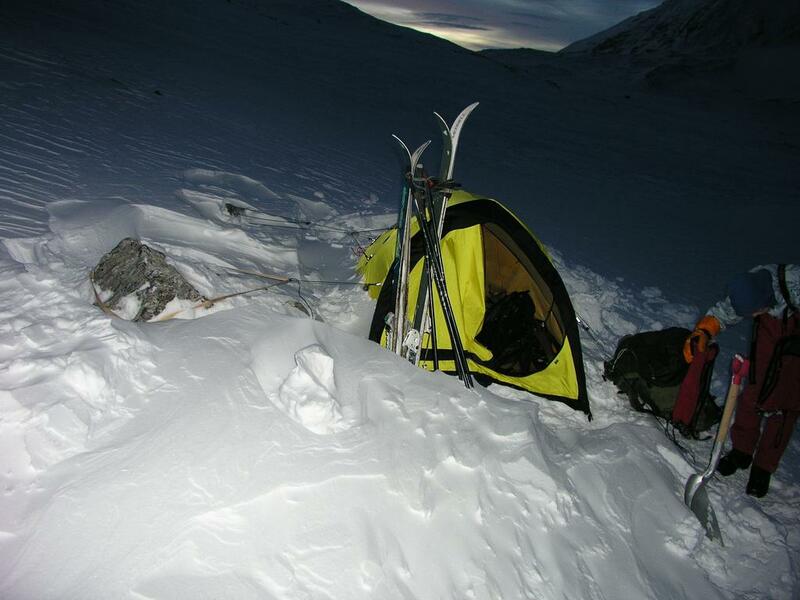 We had surprisingly strong (gale force) wind throughout the night, building significant snow drifts around our tent. By 0700 the wind died down and we had near perfect winter conditions for our "Grand Tour" of Storebreen with adjoining peaks. We started skiing the next morning at 0800, hit the summit at 0900. Next, we continued to Gråhøe (1945m) at 1000, further across the Storbreen Glacier to Digerkampen (1944m). We left Digerkampen around noon and made Blåhøe (1959m) at 1330. 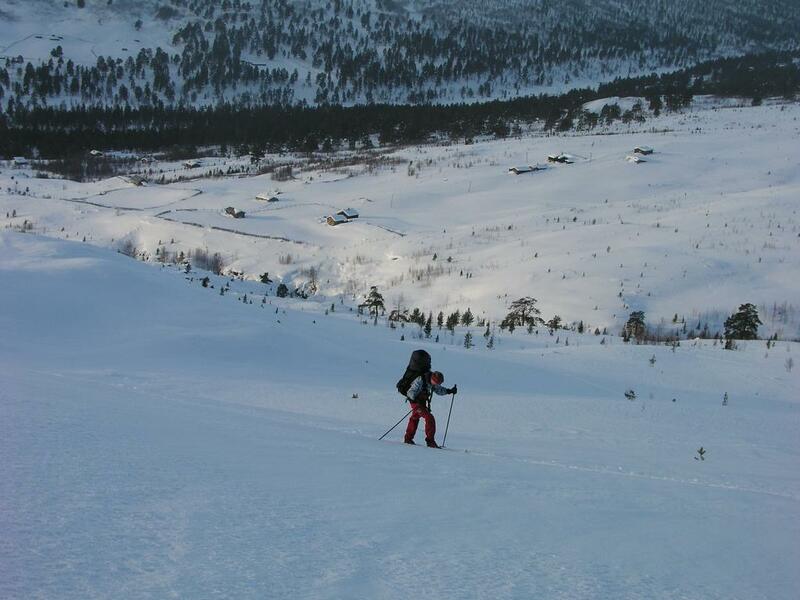 A nice ski down between Blåhøe and Gråhøe got us back to base camp around 1400. We spent another night and skied back to the car on Sunday morning in about three hours. One may note that this peak is the most isolated 2000 meter peak in Norway, also, somewhat surprisingly, it does not have a name on the M711 map. 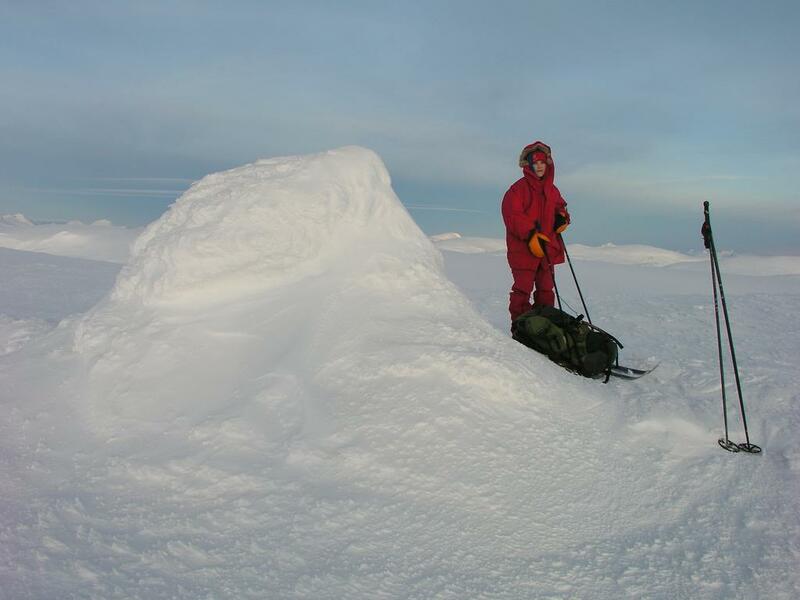 It is commonly known as Gråhøe, however, this is the peak further west. Starting the climb, Pål Jørgen with a good sized backpack. Hwy. 15 runs along the valley floor. Torddalen, the trail to the DNT hut Torsbu follows this valley. Digging out, early morning after a night with stong wind. The summit of Ø. Gråhøe, 2014 meter. Dordiholet, this craterlike hole has a lake in its bottom, almost 500 meter below. View from the sunrise in SE to SW, the steep, nearby mountain ridge to the south is Skarvedalsegga, 1961m. View from the east to south-east. View from SW to West, a part of the Otta valley is visible. View from west to north, The foreground starts with Blåhøe (1959m) behind Gråhøe (1945m) and ends with a part of Dordiholet in front of Digerkampen (1944 m). View from north to east.